Meet my brother-in-law, Jerry Trimble. Jerry has been flying helicopters his entire life. His mom has a photo of him as a two-year-old sitting in a helicopter reaching for the stick. (He’s adorable. He would hate me saying that which makes it even more fun.) He’s flown all sizes of helicopters – big ones (like those that carry fire suppressant), middle-sized ones (like those for Life Flight) and small ones (for teaching a beginner). Today, he and my sister (who is also a pilot) run a helicopter flight business in Oregon. I had the opportunity to fly with Jerry last week. Flying is second nature to Jerry. He could fly in his sleep. But, he doesn’t. Instead, he walked through a lengthy checklist of startup procedures…twice. He knows that safety is no time to trust his gut or rely on habit. Are you trusting your gut when you shouldn’t be? Before we pursue that, let’s briefly look at your brain. Your brain is an amazing processor that takes in reams of information from your eyes, ears, nose, and touch. It quickly makes sense of it all because it takes shortcuts to simplify processing. Brain shortcuts come from repetitious activity that we know as a habit. The brain skips the energy-intensive processing and defaults to habit. That’s great…until it isn’t. Do you know, as Jerry knows, when you can trust your gut and when you shouldn’t? Safety: When your work involves safety procedures or you supervise people for whom safety is a concern. They and you need to take care that you don’t default to habit. Of course, you want to develop habits that are grounded in safety but don’t lose sight of the need to be conscious and respectful of safety. Like Jerry’s checklist, frequent reminders are key. People: Have you ever met someone who you immediately liked? Or disliked? That’s because your brain took a shortcut. If it noted something familiar, it registers as “like.” If it picked up on something contrary to your values or preferences it registers “dislike.” Your brain quickly reached a conclusion – and it could be wrong. Watch for quick, gut judgments in personnel decisions. Your brain is taking a shortcut that may be more about your history than about the person in front of you. Your skill is to recognize and manage the brain shortcuts that create judgments. Quick Decisions: Particularly for experienced managers who have “been there, done that,” you decide quickly based on history. Without realizing it, you think, “Yeah, I’ve seen this before.” But, maybe you have or maybe not. For decisions with far-reaching implications, it’s worth double checking the quick conclusion of your brain. Is the current situation really like the past? What are the differences? Is the future on the same trajectory as the past? Can you really rely on the brain shortcut (your experience)? Chances are, there are many situations where your experience can be relied upon for quick decisions, but if your industry or organization is changing rapidly, big decisions merit a second look. I’m the first one to say that the gut brings valuable information to the table, and you need to skill to use it effectively. Consider your day. 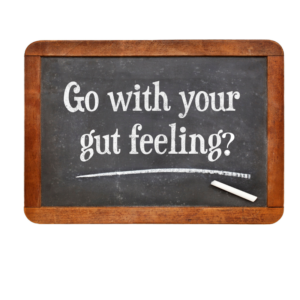 When is it okay to go with your gut for a quick reaction? When are you in situations where your brain shortcuts could lead you astray? Start now to develop the skill to tell the difference. Do you have an example of when you challenged your gut reaction and were glad you did? Posted in Decision-Making, Leadership by Shelley Row on Posted on October 15, 2018 , updated on October 16, 2018 by Shelley Row.